Every month, I get out with a camera and, attempt to capture images of the full moon. It's usually a three night event and, sometimes the weather makes it impossible. This photo was taken on the last of the three nights. I'm glad it's over. Strong winds, dark clouds and low temperatures, made it a challenging experience. Some investigation was required to see if, the phases of the moon, cause crazies to come out. Over at BBC, they say the full moon doesn't really make any difference in people. More folks get bit by dogs and horses, during the full moon but, that could be caused by mites. Farmer's Almanac says, studies prove there's no connection between crazies and the moon. And, Live Science reports, no connection between the full moon and folks acting crazy. 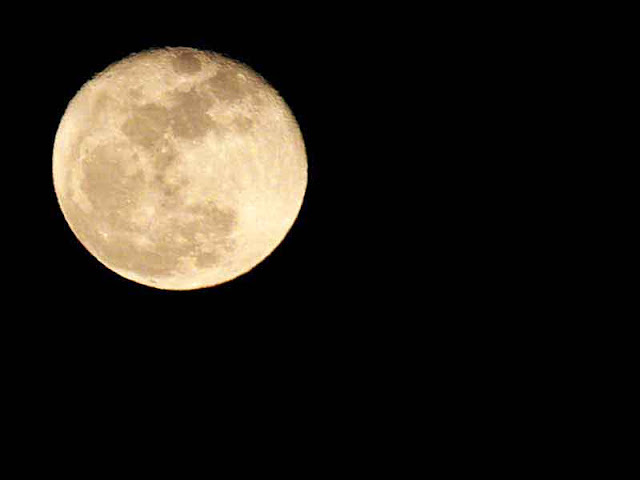 Mental Floss says, there isn't any psychological effect on people, caused by full moons. If, you look at Science Line an urban myth, is what , they might call full moon wackiness. Scientific American, debunks lunar lunacy, saying there's no evidence to support the myth. A good one was, Universe Today, talking about the pull of the moon on gravity. For example, some folks claim because, the moon affects tides, it must do the same to people. Scientists say, your body gets more gravitational pull from your chair than, from the moon. Maybe, this chair, I'm sitting on makes me crazy ! Moon Shot's Done Let's Go to Town ! Three nights in a row, I was up on the roof, freezing and shooting the moon. Once it was done, I threw the camera in the office, without downloading images. It seemed like a good idea, to get some antifreeze in my body and, check town for lunatics. It was unusually quiet in the village last night so, the bartender showed me this video. Piko Taro is all the rage, in Japan these days This version has almost 20 million views. Listen to it. It's all in English and, my grandkids love it. To prepare for an end of the year (Bonenkai) party with the family, I decided to rehearse. The bartender shot this video with his iPhone and, I did the rest. At home, showed it to the wife and, I asked her, "You think the full moon made me crazy?" She said, "No. You act crazy, all the time." Now, you know. The full moon, doesn't cause craziness. We have proof.